First and foremost, many thanks to those who have sent questions and comments and corrected my mistakes. A good deal has been written about the nature of mistakes, and wise dicta along the errare humanum est lines have been formulated. Yes, to err is human, but it is the stupidity and “injustice” of some mistakes that are particularly vexing. Once something outrageously innocuous has crept into your text, it tends to stay there. God forbid, if you write marital instead of martial or pubic instead of public! You may reread your masterpiece five times before dispatching it (this is what I always do) and still not notice the horror. For example, I meant to say that the fish name bass was for a long time pronounced as base (which is true) but wrote that it is pronounced so, though the bass happens to be the fish that we most often buy at a local store, and I know the word’s pronunciation as well as anyone around. Or, to be absolutely sure, I checked the spelling of teléfone in Spanish, and, with the dictionary open before me, wrote calmly that only Italian has adopted f in this word. In one of my books, I referred to Kipling’s Just So Stories and explained why the giraffe (!) has a hump. I have known those tales as long as I can remember. What is the blend of camel and giraffe? Carafe? My work on an etymological dictionary began with the word heifer. If I were interested in having a gravestone commemorating me (fortunately, I am not), I would like to have an image of a frolicsome heifer on it. Now, in A Bibliography of English Etymology, a volume I have edited with utmost care, the definition of heifer is short and sweet: “pig.” How did it get there? One of my brightest assistants remarked darkly: “Sabotage.” In the years to come, who will believe that I could distinguish between a young cow and a piglet? My only comfort is that, according to a Russian saying, the sword does not cut off a repentant head, and, as can be seen, I am brimming over with repentance. More about cutting (s)words will be said below. As could be expected, my recent post on spelling reform inspired many questions. This part of the “gleanings” will deal only with spelling. Sword: why does it have w in the middle? Sword was once pronounced approximately as swoord, and w before oo tends to disappear, even though we have swoop and swoon, which did not merge with soup and soon. But as “recently” as at the end of the eighteenth century men of fashion pronounced woman as ooman. (I wonder whether they ’ooed them.) Another word of the same type with w reflecting a pronunciation that has been dead for a long time is two. Four versus forty. This is a recurring question. I have heard and answered it nearly as often as the one about why flammable and inflammable are synonyms rather than antonyms (because in– can sometimes function as a reinforcing prefix; no one thinks that inflammation is the opposite of flame, so why bother about inflammable?). A serious explanation of the four/forty difference is rather technical, and I’ll give it here in a nutshell. English had two long o sounds (long o means the vowel of law, except in the dialect of those who pronounce law as la). In Middle English, the vowel o was long and closed in both four and forty. Yet in forty (a disyllabic word) it became short and then again long but open before r. The editors of the first volumes of the OED still made this distinction. The spelling of forty reflects the shortened open variant. The same holds for fortnight “two weeks,” that is, “fourteen nights.” Fourteen should have been spelled like forty but retained its ou under the influence of four. Another perennial cause of wonderment is gh in cough, ought, tough, thorough, and through. Here again I would rather avoid details and confine myself to the essentials. Middle English had the sound we hear in Scots loch or in German ach. There was no letter for it, and scribes used the digraph gh, in which g referred to the place (back in the mouth) and h to the manner of articulation (a breathed sound, a fricative). That consonant dropped out of the language. It either moved all the way to the front of the mouth and became f (hence tough, cough, and enough) or became h and was shed (hence ought, thorough, and through). The spelling of all such words is conservative, and gh gives us grief, much to the joy of those who think that spelling should be a branch of an etymological museum. The ei ~ ie problem. It is regrettable that we have retrieve, receive, believe, weird, and their likes. The order of the letters in such words is usually arbitrary. Even when it is not, we may be puzzled. For example, in sieve the vowel was at one time long, and e designated its length, but later that vowel underwent shortening. Today, sieve looks as meshy and as messy as seive might. Circuit: Why ui? Because this is the way it is spelled in French! The same holds for conduit and pursuit. Other ui words are even worse. Recruit has no justification (compare German Rekrut and Dutch recruut). Vacuum. This spelling needn’t not bother us, for vacuum hardly rhymes with boom, loom, zoom; it is usually pronounced in three syllables. Even ui in vacuity looks fine for a change (the point of syllable division in it, as, for example, also in suicide, falls between u, pronounced long, and i). Are there many words spelled alike but pronounced differently in British and American English? Yes, very many. One can pinpoint whole groups, as, for example, those ending in –ile (missile, imbecile, versatile: their last syllable sounds like isle in British and like ill in American English), and countless words like herb (homonymous with Herb in British but h-less in American), and schedule (with sh– in British). Often stresses differ (as in British weekend versus American weekend). British English is prone to the diphthongal pronunciation of i. Direction (di-rection) is not the only case. Yet privacy in British English has the same first syllable as in privilege. I have heard mythology pronounced as my-thology. Get a British pronouncing dictionary alongside of its American counterpart and enjoy comparing them. In my post, I inveighed against the use of the digraph ph (I wish it were digraf!) and wrote that phony was a perfect example of iconicity: the word means “sham” and its spelling is absurd. When in a talk show I mentioned weird as a similar case (a word has a weird spelling and means “bizarre”), I was asked whether a term exists for such cases. No, I conjured up the entire situation myself. But for want of an established term, I suggest calling such phony and weird words graphically iconic. Incidentally, I thought of a single instance of ph being used ingeniously. Consider the word phishing: it suggests fishing for dupes but it has no reference to a fisherman’s (fisherperson’s or simply fisher’s, as in German?) occupation. Are there languages in which spelling reforms are frequent? I am not aware of such languages. Spelling reform is a major social upheaval, and every attempt to institute it meets with fierce opposition. The most recent example is the reform in Germany, which was approved, stalled, and ultimately carried out. However, examples of several waves of spelling reform are known. This returns me to Masha Bell’s letter, posted as a comment to my blog. It is true that the abolition of ph would be a minor and insignificant step in the right direction, but my suggestion reflects what administrators would probably call my philosophy. If we ever succeed in changing the absurdities of English spelling, we will achieve our aim only by moving slowly. Those who studied Roman history have heard about the Second Punic War and about Fabius Maximus, the great cunctator “delayer.” I believe that in our life revolutions should be resorted to once all the other means have been exhausted, and even then after a good deal of deliberation. So I will offer a maxim, inspired by Fabius Maximus. Don’t frighten the public with hav and giv (have, give). Nibble at it. Choose the woodpecker, not the eagle, as your symbol. Get rid of the nonsense that no one needs and almost no one will fight for (rubbish like ph), stop using redundant double letters, and go on step by step. The major problem is known from the fable “Belling the Cat.” (The pun on Masha’s family name is fortuitous.) A company of mice did not know what to do with the cat, and one of them suggested that a bell should be put on the enemy. It would ring and warn the mice of the cat’s presence. The motion was carried unanimously and with great enthusiasm. But then an old mouse asked: “A good idea, but who will bell the cat?” The English speaking world has no academy invested with the authority to reform spelling. Apparently, we would need an act of Parliament/Congress or some other legislative action. I no longer remember who was responsible for implementing Noah Webster’s suggestions in the United States (color, the suffix –ize, and so forth), but if the sky did not fall after honour and colour lost their French u, we will survive telefone and even til spelled like until. I wish some candidate for the presidency of the United States announced that, if elected, he or she would fight for simplifying English spelling. I am sure this person would win the election in a landslide. In a happy and literate society, economy and foreign policy would take care of themselves as a matter of course. Uncertain about what to do with word fisherman, I decided to offer a picture of a fisherman and his wife. She was not a fisherwoman, but this detail can be disregarded. Grimm, Jacob and Wilhelm. The Fairy Tales of the Brothers Grimm. Mrs. Edgar Lucas, translator. Arthur Rackham, illustrator. London: Constable & Company Ltd, 1909. Subscribe to Anatoly Liberman’s weekly etymology posts via email or RSS. I love the English words just as they are, though accept the fact that the language is in constant flux. I don’t think it hurts a child in his early school years to learn all the funny spellings. On the contrary, it’s good exercise for his little mind, and might just be the spur to start off a life-long habit of asking why things are thus. Mind you, speaking from experience, he’ll be smacked a lot by teachers and parents. Conduit no longer belongs among the mysterious spellings. Although most of the dictionaries I checked (m-w.com, NID3, AHD4, RHD2, ODO both BrE and AmE, and Cambridge) still provide the historical “condit” pronunciation, all of them recognize some version of “con-doo-it”, “con-dwit”, or “con-dyu-it” as the primary pronunciation. OED doesn’t, but it’s still giving the OED1 pronunciation of a century ago. You have privacy backwards, according to those same dictionaries. It is the Brits who say “privvacy” and the Yanks who say “pryvacy”. Fisher is well-attested in English, but the OED’s last prose citation is from 1758 (except when it refers to the North American mustelid, of course). One of the Father Brown stories is set in a club called the “Twelve True Fishers”. Perhaps the word due for a revival. What a great picture! 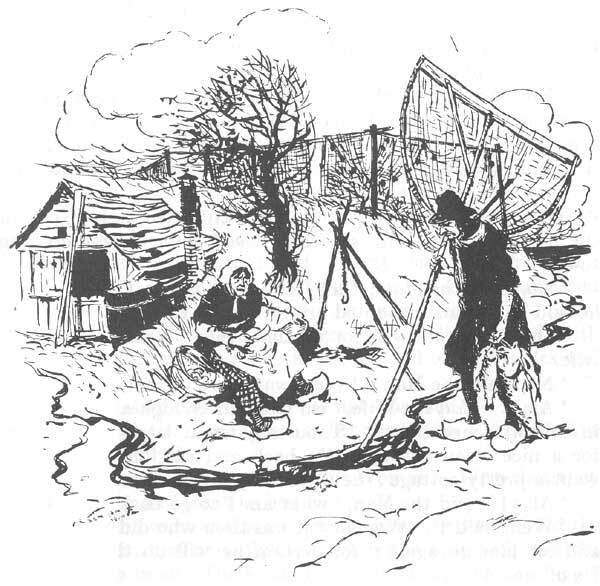 Here are links to “The Fisherman And His Wife” in the original Low Saxon and in six translations: English, Scots, Dutch, Standard German, an American cultural translation, and Pushkin’s Russian version. There are also several versions of Hebel’s “Kannitverstan”. Check out Dutch for spelling reforms: my grandfather has had three in his lifetime. People are getting tired of them nowadays , so I expect it stay stable for a while now. E.g. see http://en.wikipedia.org/wiki/History_of_Dutch_orthography for more info. I know the following is long and I apologize for a double post, but it came to me this afternoon that it might presage what we could end up with (besides a preposition). European officials have often pointed out that English spelling is unnecessarily difficult: e.g. cough, plough, rough, through, and thorough. What is clearly needed is a phased programme of changes to iron out these anomalies. The programme would, of course, be administered by a staff committee at top level from the participating nations. In the first year the committee could suggest using “s” instead of the soft “c”. Sertainly sivil servants in all sities would resieve this news with joy. The the hard “c” could be replaced by “k” sinse both letters are pronounsed alike. Not only would this klear up konfusion in the minds of klerikal workers, but typewriters kould be made with one less letter. There would be growing enthusiasm when, in the sekond year, it was anounsed that the troublesome “ph” would henseforth be written “f”. This would make words like “fotograf” twenty persent shorter in print. In the third year, publik akseptanse of the new spelling kan be expekted to reach the stage where more komplikated changes are possible. Governments would enkourage the removal of double leters which have always been a deterent to akurate speling. We would al agre that the horible mes of silent “e”s in the languag is disgrasful. Therefor we kould drop thes and kontinu to read and writ as tho nothing had hapened. By this tim it would be four years sins the skem began and peopl would be reseptiv to steps sutsh as replasing “th” by “z”. Perhaps zen ze funktion of “w” kould be taken on by “v”, vitsh is, after al, half a “w”. Shortly after zis, ze unesesary “o” kould be dropt from words kontaining “ou”. Similar arguments vud of kors be aplid to ozer kombinations of leters. Kontinuing zis proses yer after yer, ve vud eventuli hav a reli sensibl riten styl. After tventi yers zer vud be no mor trubls nd difikultis, and evrivun vud find it ezi tu understand ech ozer. Ah, ze drem vud finali hav kum tru. The ‘gh’ in the middle of words is still pronounced as a guttural ‘ch’ in the Scots of the north-east, what is known as ‘The Doric’. In thought and brought, as ‘thocht’ and ‘brocht’, weight as ‘waicht’, daughter as ‘dochter’, mighty as ‘muchty’, night as ‘nacht’, etc. Surely this illustrates the biggest problem with adopting a simplified spelling for English – someone having to arbitrarily choose a pronunciation to base it on and then imposing it on others. I agree about not scaring people with drastic reform proposals, but as I said before, because there is so much wrong with English spelling, amending an irregularity which does not cause reading difficulties or occur in many words, such as ph, would not make any noticeable difference to the appalling levels of educational underachievement which affects all Anglophone countries. So I will try to explain why I am keen on dropping blatantly surplus ‘-e’ endings. One of the concepts which young children take a long time to master, even when first introduced to it with just words which apply it consistently, is the rather ingenious ‘long, open’ and ‘closed, short’ spelling method for stressed vowels, as in ‘fate, fatal – fat, fatten’ (http://improvingenglishspelling.blogspot.com/2010/06/long-and-short-vowels.html). Because of that principle, they spend a great deal of time learning when to double a consonant before suffixes (bid, bidding) and when not to (bide, bided) and when to drop an ‘e’ (biding). 5. REDUNDANT ‘-e’ ENDINGS (have, imagine, an elaborate, nature – cf. save, define, to elaborate, mature). Ideally, we would tidy up most of that almighty mess, but we could easily at least make it a little more transparent, by making it permissible to at least drop completely redundant ‘-e’ endings. We could easily also give ourselves permission to use sensible consonant doubling (boddy, sallad, coppy) alongside the currently omitted ones, as well to omit pointlessly doubled ones (acomodation, aleviate, aplaud), on the model of Spanish ‘acomodacion, aliviar, aplaudir’, if we freed ourselves from the tyranny of dictionaries. Dictionary makers claim to reflect usage rather than prescribe it. So presumably if enough brave souls found the courage to spell more sensibly, they would follow? I was editor of a 24-page weekly entertainment magazine. One Thursday afternoon I gave the magazine a final check. When I came in Friday morning I saw a typo in one of the three words in the cover headline. It happens to us all. What’s the point of spelling reform anyway? Who needs it? Who would benefit from it? and in what way? Spelling reform could make learning to read and write English much faster. Anglophone children currently need take around three years for basic literacy acquisition (Seymour et al Brit J of Psych, 2003), with 1 in 5 still struggling with it at the age of 16. The European average is just one year. The longer time needed makes English literacy teaching more costly. Literacy failure costs heavily too. But so what if Anglophone children take extra time to learn to spell? Maybe it’s actually a positive thing. Maybe it stimulates their little brains and helps them in other ways? In any case what difference does it make if they learn to spell a few years later than other ‘rational spelling’ children? By the time they’re teenagers or secondary students, they’ve ALL learned how to spell their language (or haven’t!). And non-Anglophone children don’t seem to acquire any benefits from the ‘extra’ years they have ‘saved’ by learning to read and write a logical language! Similarly Anglophone children don’t seem to suffer in any way from their extra years of spelling!